As many of you may be aware Children and Youth International (CYI) is the legal entity that holds funds on behalf of the MGCY (to pay for youth blasts etc..) and sign MoUs on behalf of MGCY. It is a registered charity in the United Kingdom. All MGCY members are automatically members of CYI and eligible to participate in it’s Annual General Meetings. A number of members of the board trustees (Chris and I amongst them) will be stepping down at this year and it is time to find replacements. Trustees are those who are legally responsible for managing CYI, they sit on the board of CYI. The new trustees will be elected at the CYI AGM for which an email will go out shortly. To be eligible we are asking for experienced members of the MGCY to apply (2 years of membership). Experience with managing not for profit organisations and/or grant writing is required. Those who are selected as trustees automatically become ineligible to receive any MGCY funding to remove conflict of interest. Full details on the roles and responsibilities of the board of trustees of CYI can be found in the statutes attached. To apply please send the following to mike@childrenyouth.org CC’ing Chris.dekki@childrenyouth.org by December 12th. •C.V. including home address, nationality and MGCY experience. •Covering letter (Maximum 1 page). Chris and I will check for eligibility and circulate a list of eligible trustees ahead of the AGM. To fulfil UK charity commission requirements one selected will need a UK address (Not necessarily citizenship) to replace Mike as he is currently named as a signatory on the bank account. The remaining roles are open to any nationality. We have published through the UN Major Group of Children and Youth the latest participation guide for young people ahead of the Post-2015 Summit. If you want to get involved in the negotiations and the ongoing process then please read this and get involved. Click here to read the guide and get involved. We hope to get more languages produced in the coming weeks and months. As part of our work with the UN we have agreed a set of delervables to supporting young people in particpation in the UN dicussions. The Deleveriables are divided into two contrats and we report monthly as to how this has been fuffiled. Efficiently getting involved and influencing political processes at international level can be a daunting task. 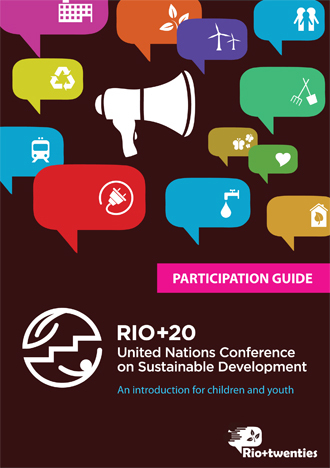 The Rio+twenties-team has developed a participation guide to make the whole process understandable, giving you the tools to effectively get involved.The guide offers specific information for youth, identifies ways to make a real difference and shares a lot of best practices, tips and tricks and existing examples on youth activism.